Most people have so many gadgets to charge, wouldn’t it be nice if they could all be lined up in one place, without all the chaotic cable clutter? Germany’s Marcus Kuchler, a 25-year product design veteran, and a team of 10 engineers worked for three years to create udoq, a universal docking and charging station. I’ve come across many docks and charging stations over the years, but never one like udoq. It’s well machined and sleek, with obvious attention to detail in its finish and in its utility. Read MORE Below or full article at Troy Media. The beauty of udoq is that you can get one off the shelf configured for Apple or Android, or have one fully customized. You can make it work even if you have a plethora of iOS or Android devices, an e-reader or a GPS device, and regardless of whether it’s equipped with Apple’s Lightning or 30-Pin, USB-C or a Micro-USB connector. Customizing it is simple. The company has an easy online function that allows you to build-to-order your udoq by using a drop-down menu and selecting the make and model of your devices. A visual outline of your udoq will appear on your screen, where you can add or change options at will. Building your udoq starts with choosing from one of four high-grade aluminum bases or rails, as they’re called. Each rail has a double layer of silicone stripping to keep your device from slipping or being scratched. An additional strip on the bottom protects your desk. The four rail models are numbered 250, 400, 550 or 700, which correspond to their approximate length in millimetres. 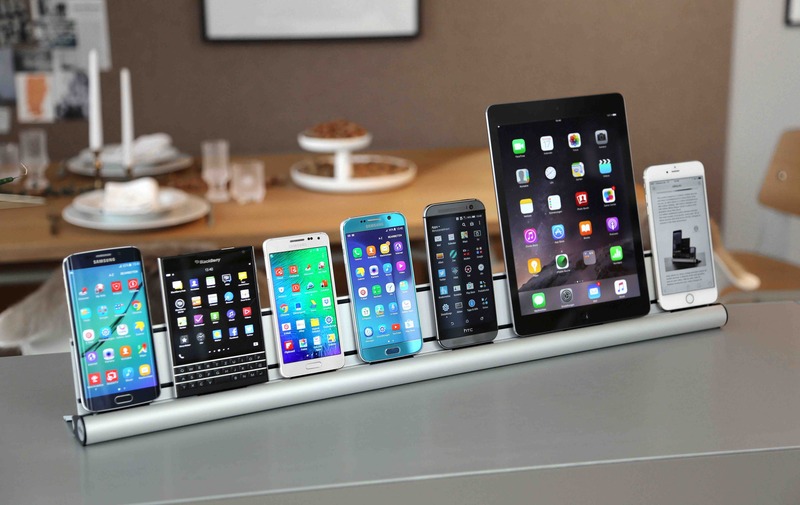 Your selection will depend on the number of devices you want to charge – up to four, six, eight or 12 respectively. Of course, the number of devices supported by your model depends on what you’re charging since, for example, an iPad has a wider footprint than an iPhone. Each device gets its own USB cable. One end of the cable snaps into a connector housing, which is then mounted onto the front track. It’s designed to easily slide side to side, and pivot back and forth to accommodate whatever you’re docking. You can also adjust the height to accommodate devices in a case or shell. Most devices sit upright and face forward, keeping them fully functional while in the dock. Should you decide to reorder your devices or need to reverse one of your connectors, the rail end caps easily pop off. A portion of each cable is hidden under the track and moves as you move the connector. The rest smoothly tucks behind and you can lead the cables to a computer or charger, or add a Cable Box (CBoxS), which can house and hide your cables and multi-port charger, leaving you with a tidy desk. Overall, udoq is very impressive. It’s well built, looks good and solves the cable clutter. And since it can be customized, you only buy what you need. 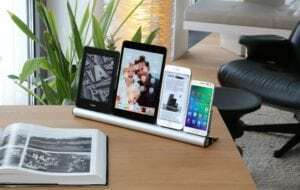 The company says it’s the first patented multi-device docking and charging station compatible with virtually all current mobile devices. But udoq is not the cheapest dock on the market. All the research and development, design and quality materials come at a price. The udoq 250 (rail only) starts at US$89, with prices ranging up to US$150 for the udoq 700. Our udoq 400 review unit fully equipped with four USB connections, a five-port charger and Cable Box runs just over US$200. Other options include adapter for Qi wireless charging and Apple Watch, and a wall-mount set. And since the assemblies are proprietary, any additional cables must be purchased from udoq. If you can find it in your budget, udoq is the ideal docking solution for any desk. You can order udoq directly or find pre-configured models for Apple or Android on Amazon.